The image of the sun above was recorded in the light given off by iron atoms that have lost 11 of their 26 electrons. The energy required to remove that many electrons is far greater than the energy available at the surface of the sun. 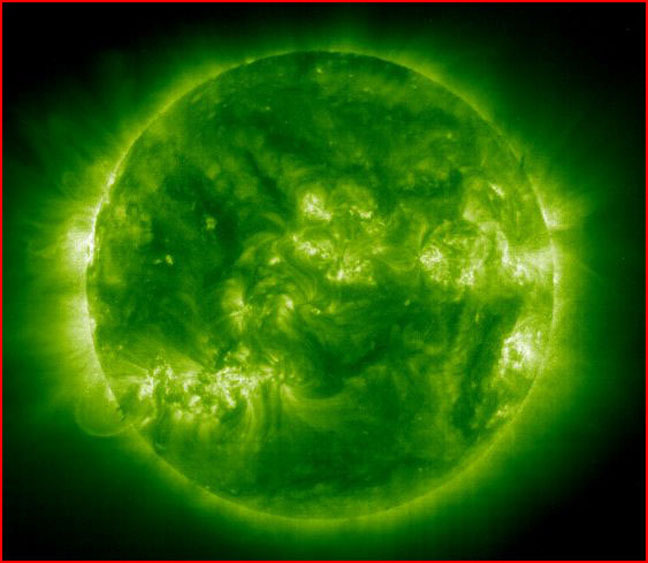 These iron ions occur high in the sun's atmosphere--in the corona--where the effective temperature is 2 million degrees or more, 400 times that of the photosphere. The conventional explanation is that the high temperature causes the iron atoms to collide with enough force to knock off those 11 electrons. But then the question arises about how the atmosphere can be hotter than the surface. The corona is farther away from the putative source of energy inside the sun, and it is less dense. It should be cooler than the photosphere. The Electric Universe reverses the accepted ideas of which phenomenon is cause and which phenomenon is effect. The sun's atmosphere contains a complex of electrical fields that are strong enough to pull off those 11 electrons. A field that strong will also accelerate the ions to speeds interpreted as high temperatures. This activity is only one element in a circuit that connects the sun with electrical currents in the Galaxy. These galactic power lines are the source of energy that "lights" the stars, including the sun. The energy from those power lines is liberated at the photosphere rather than being transported from the core to the surface. The voltage between the sun and its galactic environment is not distributed uniformly and gradually. As is typical with plasma behavior, most of the voltage difference occurs in "double layers" (DLs). These are thin layers with an excess of positive ions on one side and an excess of negative electrons on the other. They resemble, and act like, capacitors: They store electrical energy in the strong electrical field between the positive and negative layers. Each DL is separated from the next by a low voltage gradient, across which ions and electrons "drift." This drift current is often called a wind. A familiar example is the "solar wind" that drifts from the DLs near the sun to the DLs that make up the heliopause at the other end of the sun's connection with the galactic currents. When the low-energy iron ions from the photosphere drift into the DL above, the stronger electrical field strips off more electrons and accelerates the ions to high speeds. The strength of the field keeps the ions moving in alignment so it is not apparent that their energy is increasing. But when they emerge into the low-voltage gradient of the corona their motion becomes turbulent, like that of water in a waterfall when it hits the river below. Because temperature is a measure of randomness of motion, the corona appears to "heat up" suddenly, and the 11-times-ionized iron atoms begin to radiate their newly acquired energy. What the Electric Universe sees in "the iron sun" is the iron-ion component of the electric current driving the sun's radiation output as part of a galactic electrical circuit.